McLaren is best known as a Formula One racing team with a string of world-beating drivers to its name - from Alain Prost and Artyon Senna to Mika Häkkinen and Lewis Hamilton. This week the team is at Hockenheim for the German Grand Prix and all eyes are on driver Jensen Button, winner of the 2009 F1 Championship, to produce a strong showing following his recent fourth place finish at Silverstone. The UK-based company is a world force in the sport, but it's less known that since the 1980s, its success on the track has been partly down to its work on embedded electronics, which replaced the comparatively inefficient and unreliable mechanical fuel injection systems of the era. Since then, the company's work in the field has seen it combine electronics systems, sensors and networks to improve cars through the constant generation, transmission and analysis of data, a practice that is now commonly associated with the Internet of Things (IoT). McLaren's IoT journey began in 1989 with the formation of McLaren Electronic Systems (MES), which was, in the company's own words, formed "to allow it to become the master of its own destiny". 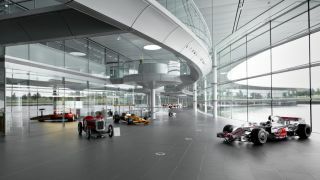 A decade-long plan followed in 1995 to build a new futuristic HQ in Woking, Surrey, which became the McLaren Technology Centre (MTC). More Star Trek than Silverstone, it would eventually bring MES, in addition to its racing, automotive and marketing teams, under one roof when it opened in 2004. The MTC is where McLaren develops its IoT solutions for Formula one, which revolve around communication between embedded car sensors and the Engine Control Unit (ECU), the electronic "brain" of the car that takes around 30 hours to build, with parts painstakingly assembled by hand. McLaren has developed and supplied a standard ECU, in addition to the software that controls it, to all F1 teams and engine makers since 2008. While the software is largely largely locked down to prevent teams from manipulating it for extra speed, they are permitted to write additional software to fine tune breaking and manage the car's torque delivery. Each ECU contains micro controllers by former Motorola unit Freescale that feed back data from cars to racing teams for analysis. This allows them to make decisions in the garage, pit lanes and on the track to slash valuable milliseconds off lap times. Peter van Manen, Managing Director of McLaren Electronic Systems, explains that the process also allows teams to constantly improve cars throughout the racing season. "The cars evolve every two weeks of the year," he says. "This is done by changing aspects like aerodynamic surfaces and suspension, meaning around five to 10 per cent of the car is brand new every two weeks." To provide connectivity between the cars and racing teams, McLaren sets up a high-speed, fibre-optic telemetry system that provides almost 100% coverage on all race tracks including the tunnel in Monaco, the forest in Monza and the figure eight in Suzuka. Data is sent from cars back to the garage at a rate of between 2-4Mbps over antennas installed around tracks, meaning each car sends around 1.5GB of data in real-time during a Grand Prix. "Receiving that data allows the control centre to do things like modelling the engine to tell how much life is left, checking the tires to see how much they're degrading, and checking fuel consumption," van Manen says. "The next step is sending that data back to HQ over the cloud to be turned into more contextual information, allowing even richer decisions to be made."